"This is a show that is as fun as it is informative, and in a sense, heart rending. The stories fittingly transcend race, and can be enjoyed by people of all hues." "The play provides a remarkably balanced portrayal of the progress black women have made in redefining social standards of beauty...some of the most inspiring stories!" On Sunday, Dec. 7th, Donna Sam, host of IN THE MIX, will lead a talkback discussion with Celebrity Stylist, Tonia Bell. On Sunday, Dec. 14th, join us for a Book Signing with Elsie Taylor, author of "Hungry for Wellness." Elsie will lead a talkback discussion after the play. 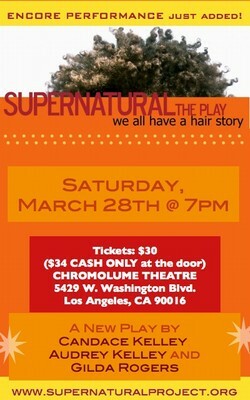 SUPERNATURAL: The Play takes you front and center to a natural hair meetup where women share how their hair journeys have shaped who they are today. If you haven’t heard, women of color around the world are meeting and talking about natural hair. They are doing it fabulously in droves through hair workshops, hair makeover experiences, hair lectures, hair product testings, and so much more. You name it and women are coming together to celebrate their natural hair. When they meet, they bare themselves by sharing their stories and exchanging information. Simply Google “natural hair meetup” and your search engine’s results will be explosive.